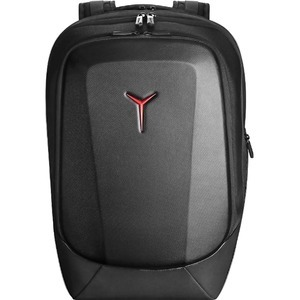 For gamers with a lot on their shoulders, the Lenovo Y Gaming Armored Backpack more than delivers. With 3 compartments and 16 pockets, you'll be well-equipped to carry up to 17" of hardware, peripherals, and all your other gaming essentials - there's even an inside latch designed specifically for your headset. To ensure your arsenal is protected, the Lenovo Y Gaming Armored Backpack features a modified weatherproof vinyl exoskeleton. Time to gear up! FEATURES:1?Limitless Storage Potential 3 compartments and 16 well-placed pockets give you the freedom to haul up to 17" of tech and all the peripherals you can imagine.2? Maximum ProtectionYou may need an umbrella, but your backpack doesn't! With a hard, weatherproof exoskeleton, you'll be well-equipped for anything Mother Nature throws your way.3? Built For ComfortFor your back: a compression-molded back panel providing airflow ventilation. For your shoulders: adjustable shoulder straps paired with a supporting chest buckle.